I don't know what happened, maybe Battlestar Galactica happened, but I stopped playing this game before I finished it. I picked it back up over the weekend and realized just how much I missed it. The charm runs thick in LBP2, though not as much as its predecessor, probably because it's stuff we've all seen before. The polish is amazing, though, and the new mechanics and toys are fantastic. The only thing I don't quite like is the community levels. Some of them are amazing, don't get me wrong, and this extends the replay value infinitely. The problem for me comes from the new tools. You can now make full-on games, not just levels in a platforming game. RPG's, space shooters, first-person shooters, you name it. Since you *can* do that, everyone is doing it. It's more difficult than it should be to find platforming levels. The first LittleBigPlanet was the first game I got a platinum trophy on. I played the hell out of it. I think I'll do the same with LBP2 now as well. I tried playing LBP demo on the PS3 and didn't really think it was that good. Is there something of the game that I missed? Is a good platformer or is the charm in building your own levels? Is it good as a multi-player game w friends? It is fantastic as a multiplayer game with friends. 4 player co-op, online or on-couch. Some of the mechanics can get a bit quirky, but it is a solid platformer. Level building is tons of fun, which is something I don't normally care about in games. Plus, Stephen Fry narrates. STEPHEN FRY, Jon. Awesome. Ill give it a second shot, maybe I was just in a poor mood that day. The thing about the demo of the first one is, it doesn't really give you a good glimpse into what the game has to offer. That could be part of it. 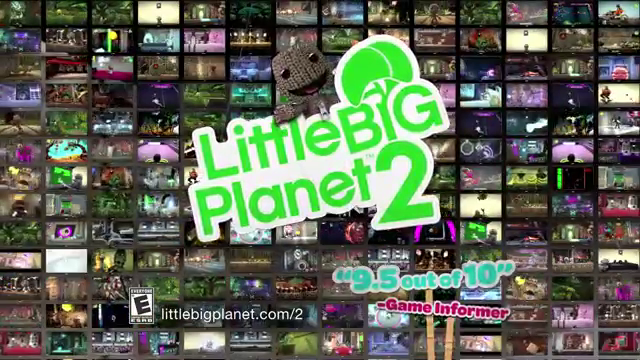 LBP2 has a demo out now too, which is much more frantic and the first world does give you a better glimpse of the game as a whole.